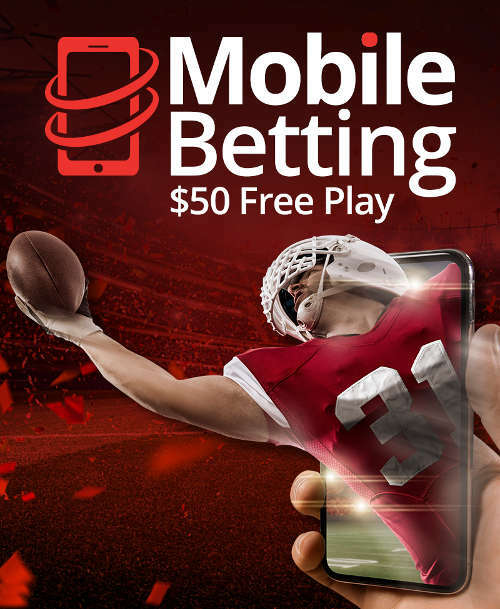 $50 Free Mobile Bet from BetOnline.ag! Redeem the BetOnline promo code BOL1000 and get a $50 free mobile bet, $25 free prop bet, $25 free live in-game bet, and 50% up to $1,000! BetOnline offers one of the best welcome promotions for sports bettors anywhere! Redeem BetOnline bonus code BOL1000 today! BOL1000 Sportsbook 50% deposit bonus up to a max $1000, plus $50 free mobile bet, $25 free player prop bet, $25 free in-game live bet, 10x wagering requirement, min $25 deposit. CRYPTO100 Sportsbook 100% deposit bonus up to max $1,000 on first Crypto (Bitcoin) deposit, 14x wagering requirement, min $20 deposit. LIFEBONUS Sportsbook 25% reload bonus up to max $1000, 6x wagering requirement, min $50 deposit. CRYPTO35 Sportsbook 35% reload bonus up to max $1000, 6x wagering requirement, min $20 deposit. BOLCASINO Casino 100% deposit bonus up to max $1000, redeemable 3 times, 40x wagering requirement, min $25 deposit. BetOnline.ag is an online sportsbook that caters to people who enjoy NFL betting as well as wagering on other sports. It’s also a racebook, a casino and a poker room. In the following, we’ll go over how to sign up, how to make a deposit, the sign-up bonuses, the reload bonuses, contests and much more. BetOnline.ag is currently offering promo code BOL1000, which you can redeem while making your first deposit. Note that this offer is not available to members who’ve already made a deposit. This offer requires a minimum deposit of $25, and if you meet that criteria, then the sportsbook will match your deposit by 50 percent. So, if you deposit $25, you’ll have $25 in your account plus a $12.50 bonus. In order to max out the bonus, you’d need to deposit $2,000. Be aware that deposits made via Neteller or Skrill are not eligible for this promotion, so you’ll need to choose another payment method if possible. Also, note that the bonus money is limited specifically to the sportsbook, so you can’t use that money for the casino, the racebook or even in-game NFL bets. The bonus has a 10x rollover requirement, so if you deposited $50 and claimed a $25 sign-up bonus, you’d need to play through $250 before making a withdrawal. You must also wait 30 days from claiming this bonus to make any withdrawal. Click here to join BetOnline! The problem with depositing with a credit card is the 6.5% fees! See the screenshot above. So we highly recommend depositing with Bitcoin or one of the other supported cryptocurrencies to avoid all the transaction fees – both when you make a deposit and a withdrawal. 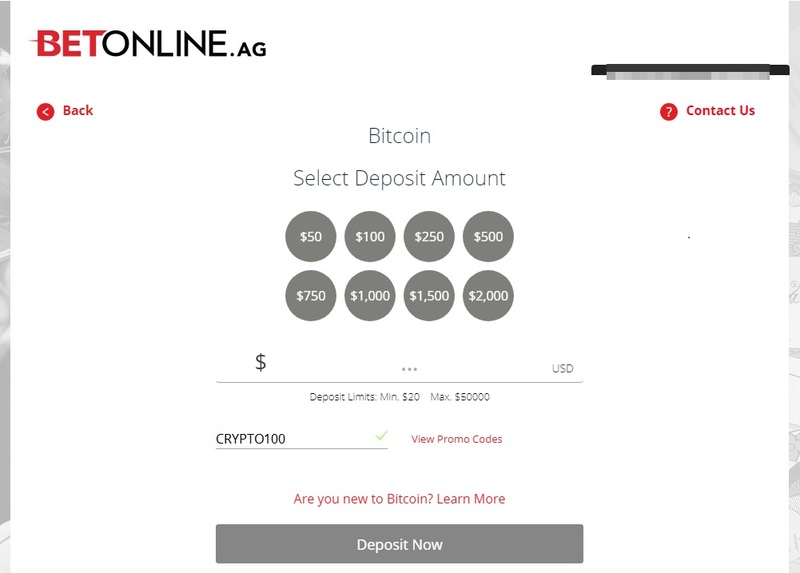 If you plan to make your deposits and withdrawals in cryptocurrencies, such as Bitcoin, Dash or Ethereum, BetOnline.ag offers specific bonus codes for that. Redeem one of the BetOnline crypto promo codes and receive a larger bonus with lower wagering requirements! Use promo code CRYPTO100 for a welcome bonus that will match your first deposit of at least $20 worth up to $1,000. When reloading, use promo code CRYPTO35 to have your deposit of at least $20 worth matched by 35 percent up to $1,000. There is a 6x rollover requirement on all of these bonuses. In addition to the welcome deposit bonuses, new customers receive additional free bets, reload bonuses and more! 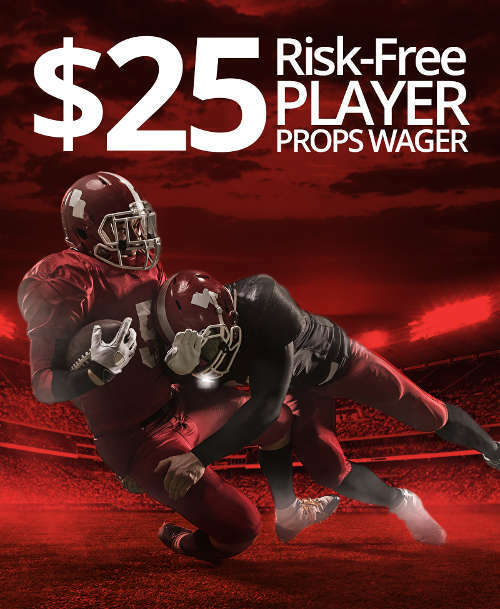 Claiming the welcome bonus does not prohibit you from take advantaging of some of the other introductory offers available, such as the $25 risk-free wager for in-game betting, a $50 free play for mobile betting and a $25 risk-free player props wager. However, you’ll have to play through your bonus first, and then, use the cash that you deposited to participate in these opportunities. 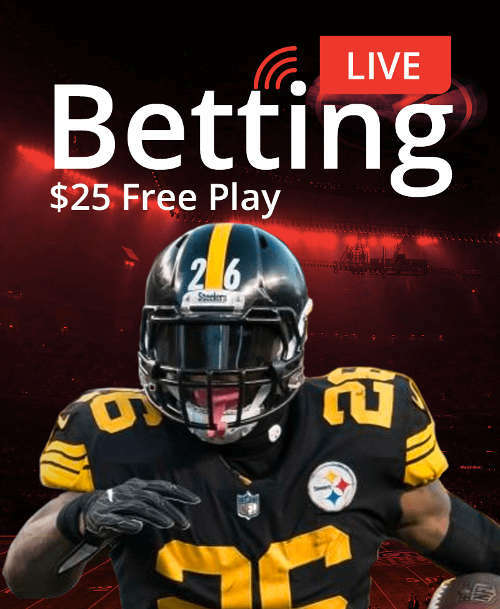 The live betting system at BetOnline.ag lets you bet on NFL and other games that are already underway, and you can cash out bets before a game concludes. So, if there’s an upset in the works during the third quarter of Steelers @ Browns, you could get in on the action. Make your first such bet $25 or more. If it loses, you can then contact support to get a $25 free bet with a 6x rollover requirement! No app is required. When you visit BetOnline.ag from your smartphone or tablet, you’ll be accessing the mobile sportsbook. Make your first ever mobile bet. If you win, congratulations! But if you lose, you can then email support for a mobile free play that will match your original bet up to $50! The player props system at BetOnline.ag lets you customize player-specific prop bets. You could, for instance, bet that Saquon Barkley will score at least two touchdowns against the Eagles, or you could opt for a more complex bet to increase the odds and potential payout, such as betting on Patrick Mahomes to make 20 completions and pass for 3 TDs and 270 yards. Make your first such bet at least $25, and if it loses, contact support to get a $25 free play. 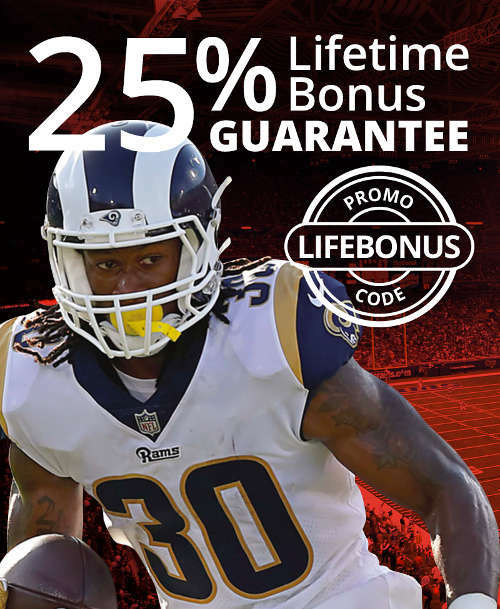 BetOnline.ag guarantees that you can get a bonus on every deposit of at least $50 that you ever make at the sportsbook. If no other bonus is available, the promo code LIFEBONUS will always work. When used, the BetOnline will match your deposit by 25 percent up to $1,000. The bonus money is limited to the sportsbook, and there is a 6x rollover requirement. As with all bonuses at BetOnline.ag, once the bonus is claimed, you must wait 30 days before requesting a withdrawal. Note that there is no limit to how often you can use this code, but you must play through all bonus money of an active offer or meet the wagering requirement before another bonus can be claimed. Our Take: The deposit bonuses at BetOnline.ag are excellent for traditional sports betting, such as betting against the spread in advance of a game. The rollover requirements are low and straightforward. The risk-free bets are best used situationally. They require big bets from the perspective of the average bettor, so we wouldn’t seek them out. If you happen to be placing a $50 wager, however, and haven’t yet made a mobile bet, then that offer is certainly worth it. That line of reasoning holds true for the other free-play opportunities as well. BetOnline.ag also hosts contests. These activities are free to enter with a valid account, and you can win actual cash and other prizes without risking anything at all. This is important particularly with the Super Bowl almost upon us. There are three NFL contests: a 10-question predictor with a $5,300 prize pool, a final score predictor that gives every winner $5,300 and a drawing for a trip to see the Rams and Patriots play in person. 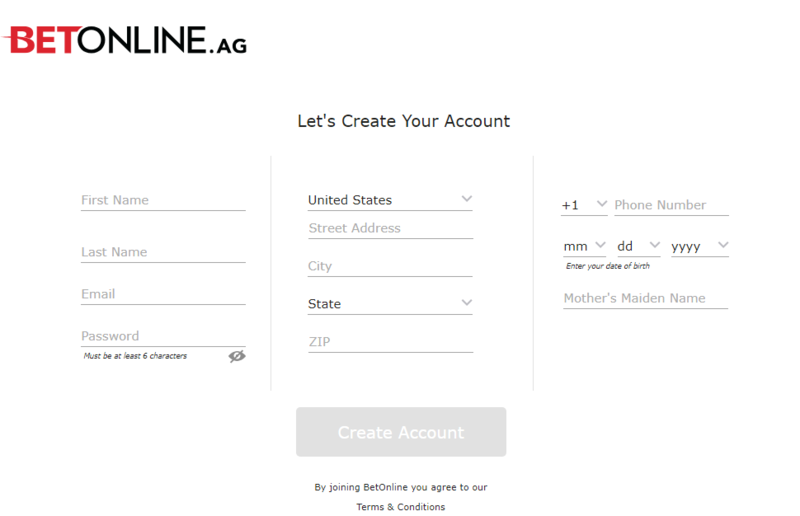 In order to participate at BetOnline.ag, you’ll need to register an account. You can register through either the desktop website or the mobile website. You need to provide a valid email address as well as your full name, country, postal code, phone number and date of birth. You’ll need to validate the email address in order to finalize account creation. No payment details are required until you choose to make a deposit. It is not necessary to use any promo codes during account creation. 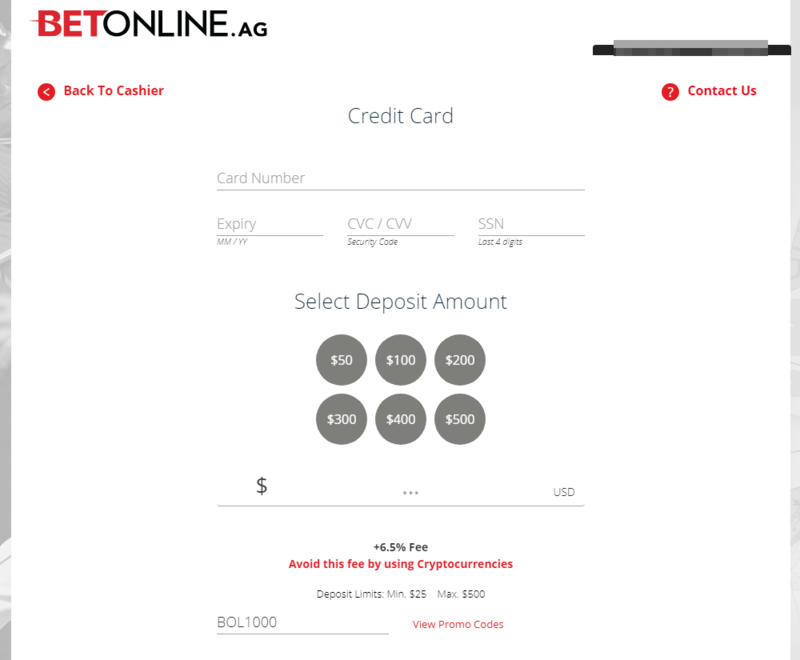 Promo codes at BetOnline.ag are generally used during the cashier process. Free offers are generally claimed automatically or through customer support. Once your account is created, it provides you access to all services at BetOnline.ag, which in addition to the sportsbook includes the racebook, casino and poker room. No download is required with the exception of the poker software, which is available for PC and Mac. Access BetOnline.ag through a desktop or mobile web browser. If you haven’t done so yet, create your account and validate it. Click or tap the link for the cashier. You’ll notice a live help button that you can click on at anytime if you run into trouble. 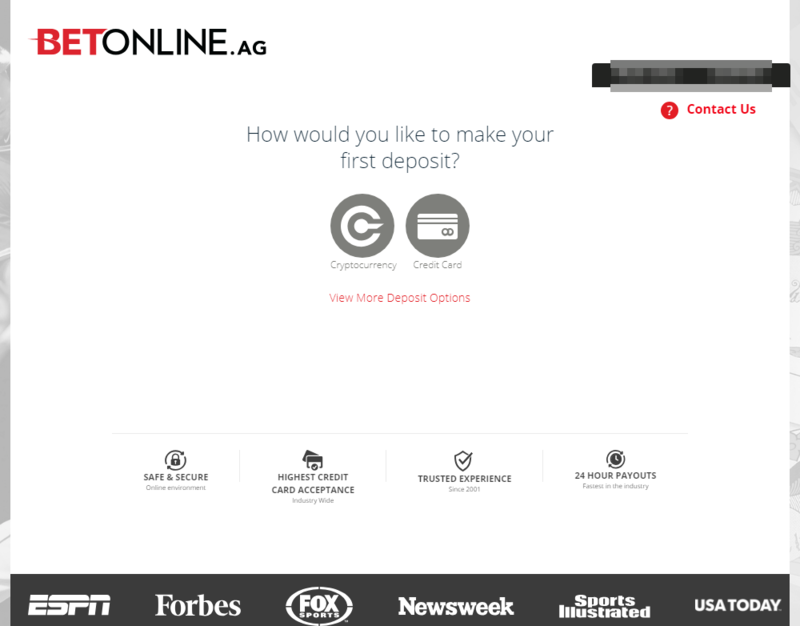 Click the deposit button, and then, select your deposit method. Note that not all deposit methods are supported as withdrawal methods. Also, note that some deposit methods, such as wire transfers, are not automated and will bring you into a chat with support. On the deposit page for your method, you’ll enter the appropriate details, such as your credit card number. There will also be a box available for a promo code. This is important! You need to enter the appropriate code, such as BOL1000 for the welcome bonus, on this page before completing the deposit. If you’re depositing via live chat, then tell the rep which bonus you want to claim alongside your deposit. Sign Up to BetOnline Today!